Marietta Square was transformed into a giant canvas this weekend in celebration of the city’s annual Chalktoberfest. With three streets of chalk artists and an entire street of craft beer, as well as live music, visitors had plenty to enjoy over the weekend. Sally Macaulay, the Executive Director of the Marietta/Cobb Museum of Art (MCMA), said she was “pretty excited” about this year’s festival, which is also the first international festival. This year, the team brought in “88 professional artists from all over the world,” according to Macaulay. “We had four or five artists from Mexico and one from Canada,” Macauley said. The chalk artists were all housed between Church and Cherokee Street, and also included work from husband and wife duo Dave and Laurie Conley, Ever Galvez and local artists like Katie Bush, an Atlanta native, and the Chalk Twins, Devon & Lexi Fulmer. Visitors at Chalktoberfest also had plenty of food and drink to choose from thanks to the food trucks lined up on Atlanta Street. All of the restaurants in the square were also open for the festivities. It was also easy enough to pop on over to the Craft Beer Festival on Cherokee Street. Tickets started at $35 online and raised to $45 at the festival, but visitors definitely got a buzz for their buck. There were over 120 different craft beers available for tasting, with support from local breweries, like Terrapin Beer Co. from out of Athens, Georgia. Guests who bought a VIP pass to the beer festival also got a commemorative pint glass to remember their trip. On Oct. 9, the beer festival packed up and left, making way for an entire street of children’s arts and crafts. Amateur artists could also try their hand at chalking at one of the non-professional competitions held Sunday, according to Macaulay. Prizes were also awarded for the top-ranking artists in the professional and non-professional competitions. “They [received] gift cards…I think they were mainly gift cards. Our education director decided on the prizes for the non-professional student section. For the professional section, which is what I handled, we had a people’s choice award and they won cash prizes. With the non-professional student section, they got gift cards from The School Box or food gift cards,” Macauley said. If food and prizes weren’t exciting enough, fest-goers were also treated to two days of live music, courtesy of several local artists, including Marietta oldies Time Bandits. There was also an “All-Star Jam Session,” for all the bands to come out and play together, and a performance by A1A: The Jimmy Buffet Tribute Band. 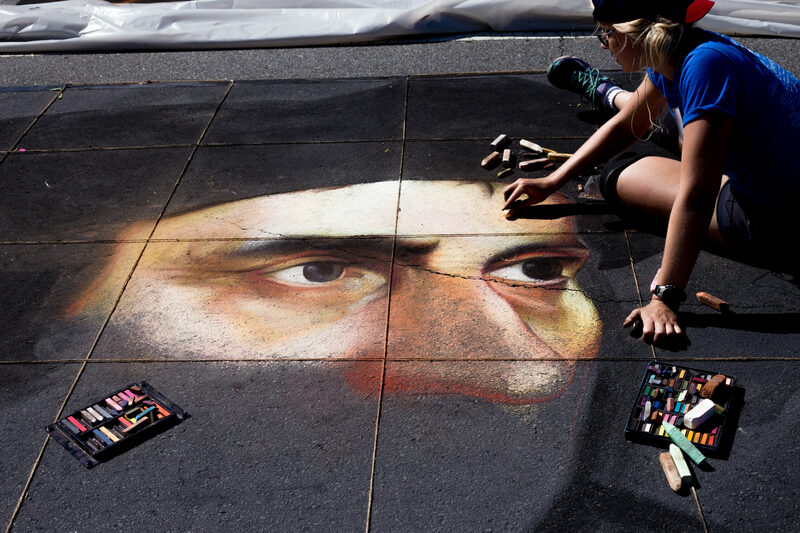 This year’s People’s Choice winners from the event is available on the Chalktoberfest website. There’s a story behind every good name and Chalktoberfest’s is a few years in the making. It all started when Macaulay was introduced to the Sarasota Chalk Festival by a co-worker. “Originally I had a board member whose parents lived in Sarasota, and he just said ‘Sally, you need to go to this chalk festival in Sarasota. They do this huge festival and it’s really kind of cool.’ So I looked it up online and thought, ‘Oh God, this is great,’” Macauley said. Macaulay talked with the director of the Sarasota festival and borrowed two of their chalk artists for a special chalk section at Marietta’s Art in the Park celebration, held every Labor Day. That year proved to be rainy, though, with hurricane warnings for the area, which forced the artists to work on canvas inside the MCMA. The next year, the event more than doubled, with Macauley bringing in 20 artists to participate in Art in the Park again. It opened as the Marietta Chalk Festival until, one fateful night, Macaulay woke up inspired. 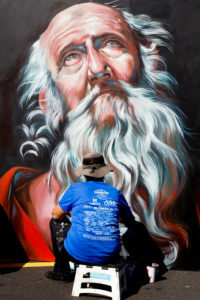 Since adopting the Chalktoberfest moniker, the festival has grown from its two-artist show the first year to an impressive 88 artists, with an estimated 40,000 people in attendance. Macauley doesn’t want to stop there, though. She’s already got plans to make next year’s festival even better. Tuesday – Friday: 11 a.m. – 5 p.m.
Saturday: 11 a.m. – 4p.m. A collection of watercolor on kaolin clay, “Modern Frescoes” captures Cavanaugh’s desire to capture the unseen and understand the deeper parts of a human soul. Kellogg builds his paintings up layer by layer to capture every day scenes, from realistic landscapes to worn out tires. Kellogg’s style was inspired by modern abstract painters.